The Pinwheel is a traditional block and it is timeless. 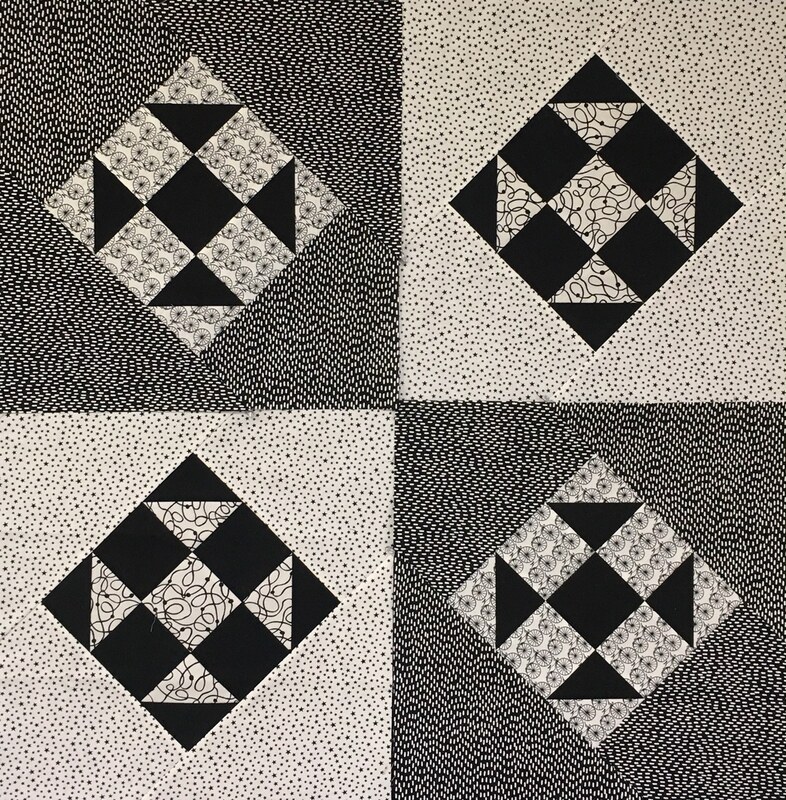 Joined in rows, these blocks make beautiful joiners/sashing or borders. Four blocks joined together make a very interesting larger block. 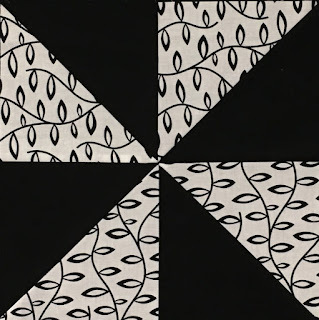 They can make a good quilt design into a great quilt design. "something" to just give the WOW factor. 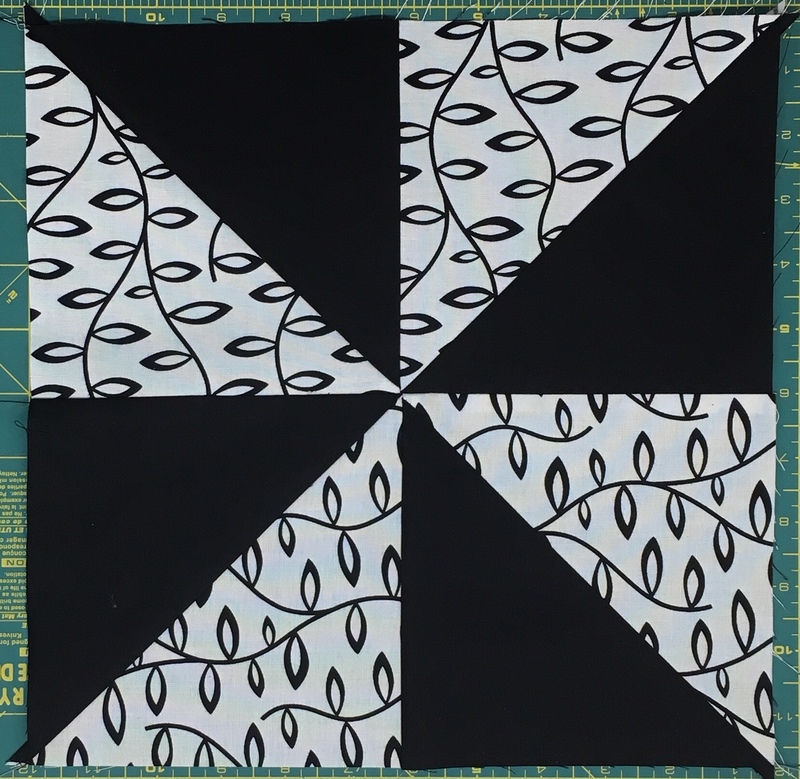 These small Pinwheel blocks can do that. 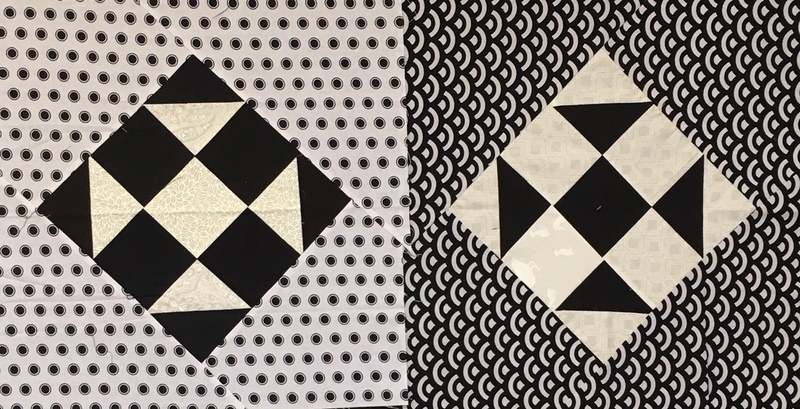 The large Pinwheel blocks will be the eye catching part of many of the quilts we make. 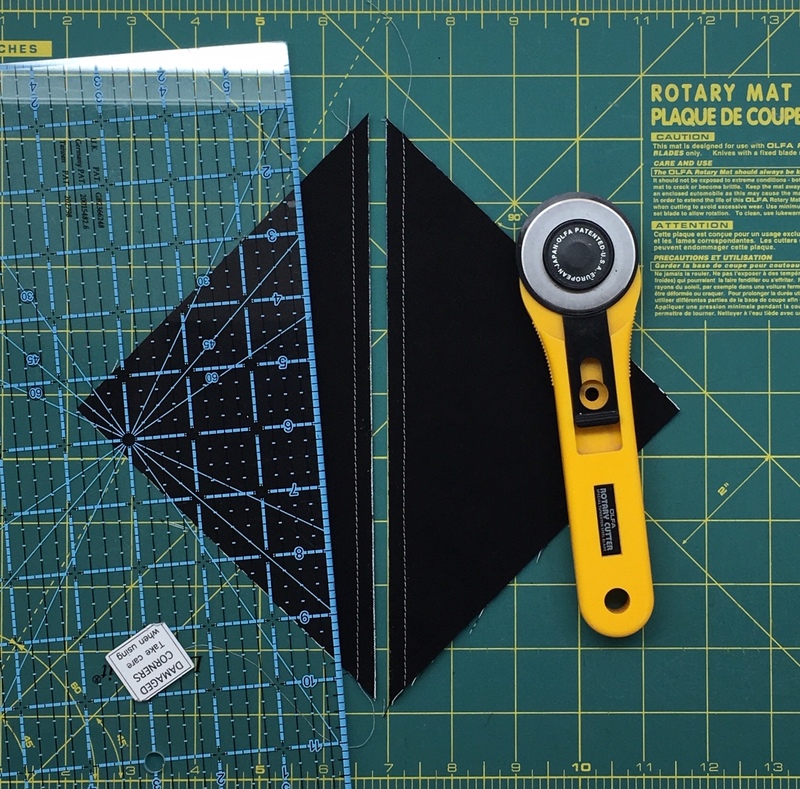 You can make just the small size or just the large size. You can make any number of both sizes. Equal numbers of each size are not needed. 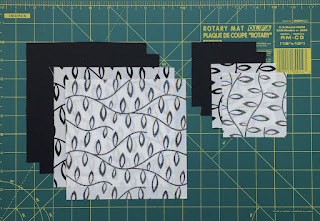 to be made from the same two fabrics. The same applies to each colour combination. 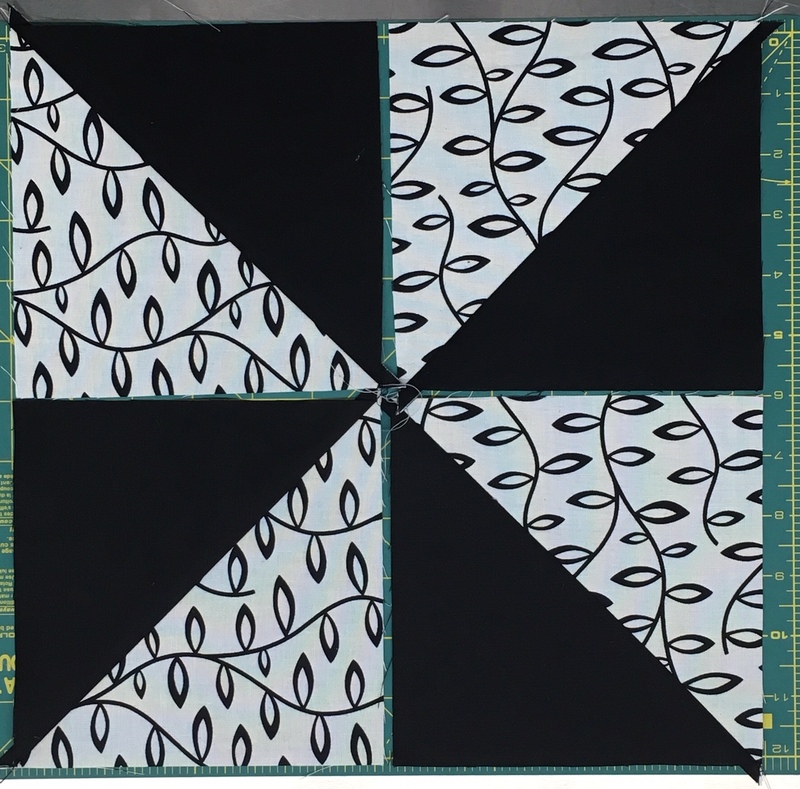 it won't be seen in the finished block. Use a marking tool that can be seen easily. both sides of the line so they won't need to be moved while sewing. 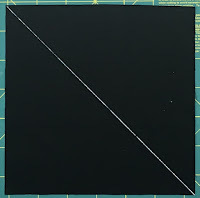 Sew two rows, each one a quarter inch from the drawn line. Cut along the drawn line. square and create a kite shape. Choose a side to press to eg. 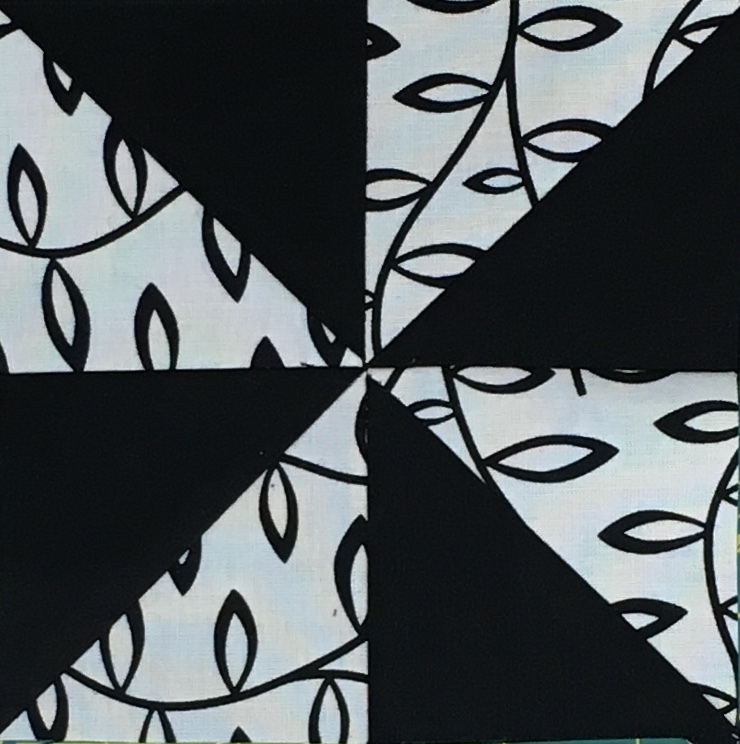 the black, and do the same for all four squares. 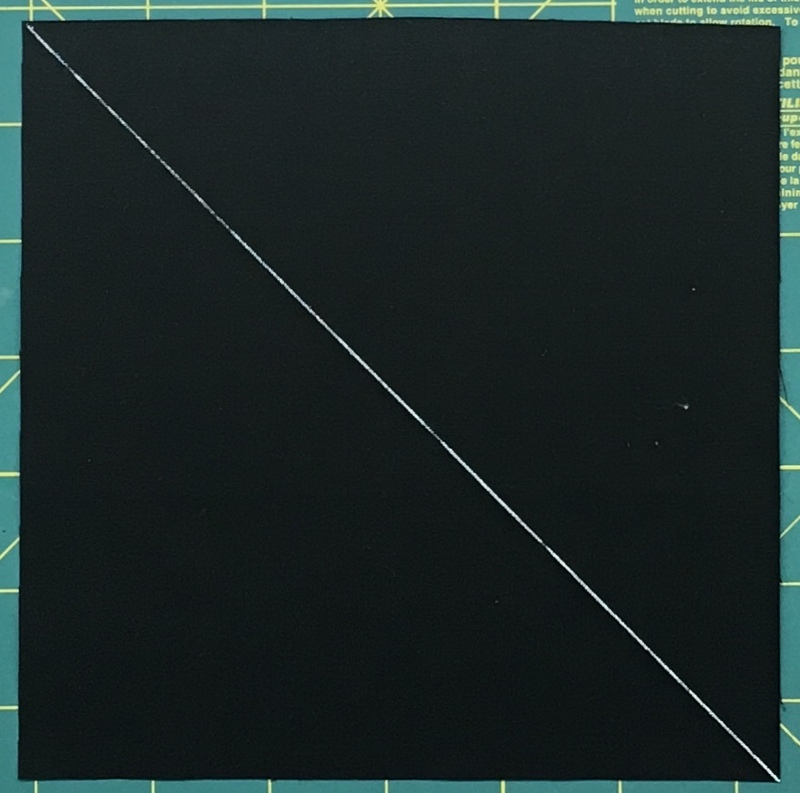 Join two squares together, by placing them right sides together. 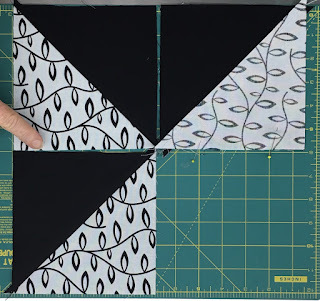 The right hand side of the block shown is pinned ready to sew. Careful...sew squares together where the two edges are touching as shown on the left hand side. Press these seam allowances to the same colour as when pressing the previous seams. 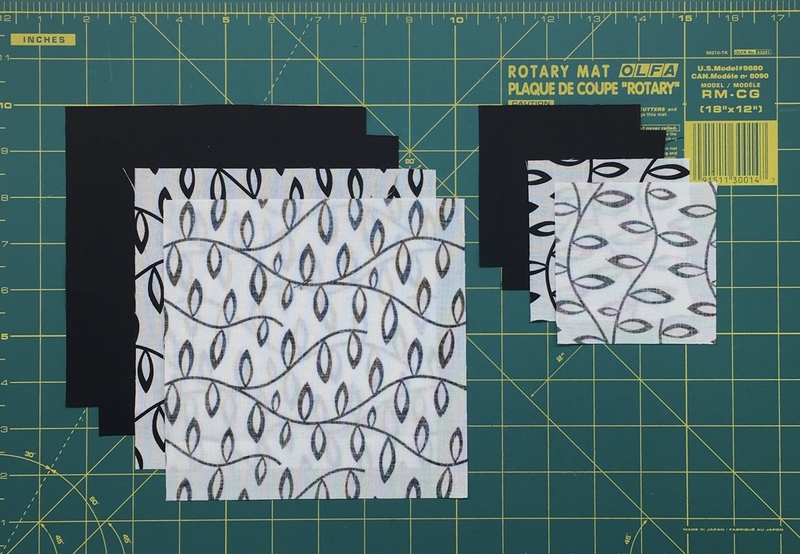 This will make it easy to "lock" the seams in the final row of stitching. 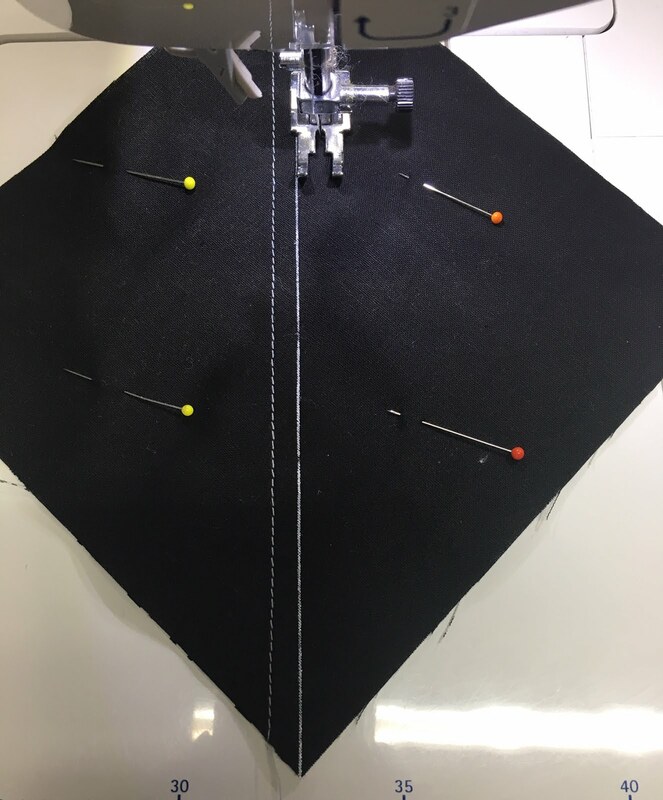 of the seam and stab a pin through the stitching of both sides. centre of the block but place a holding pin either side of the stab pin. Sew the final seam to make the Pinwheel block. 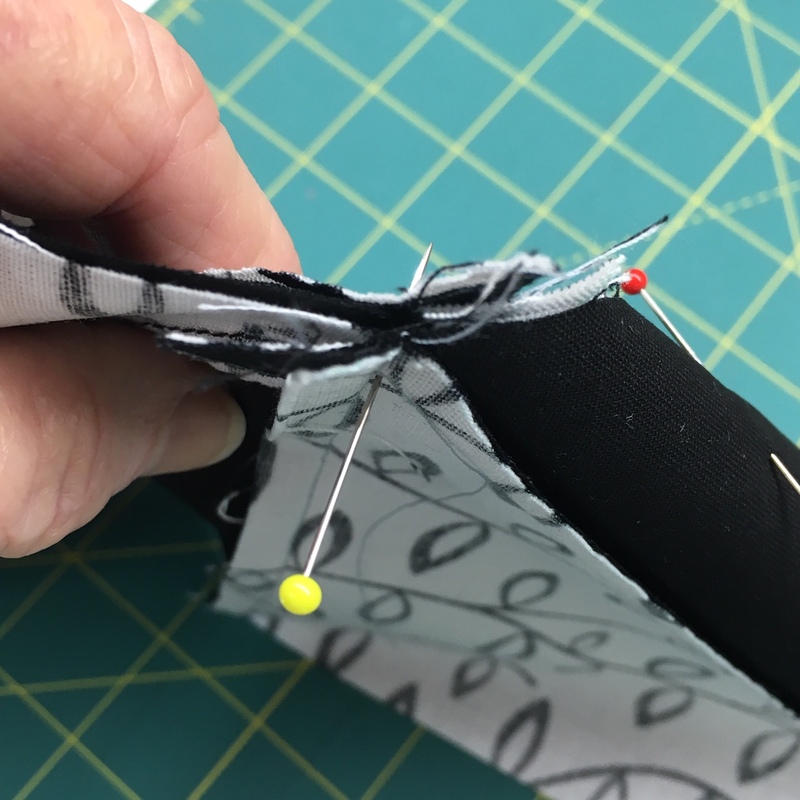 Press the seam allowance to one side. 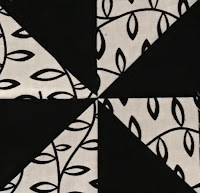 for the quilts they will be designed into. 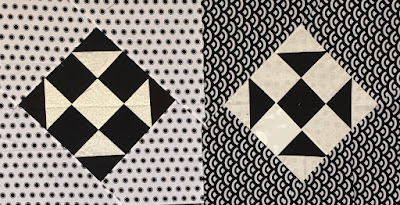 Do not sew blocks to one another. 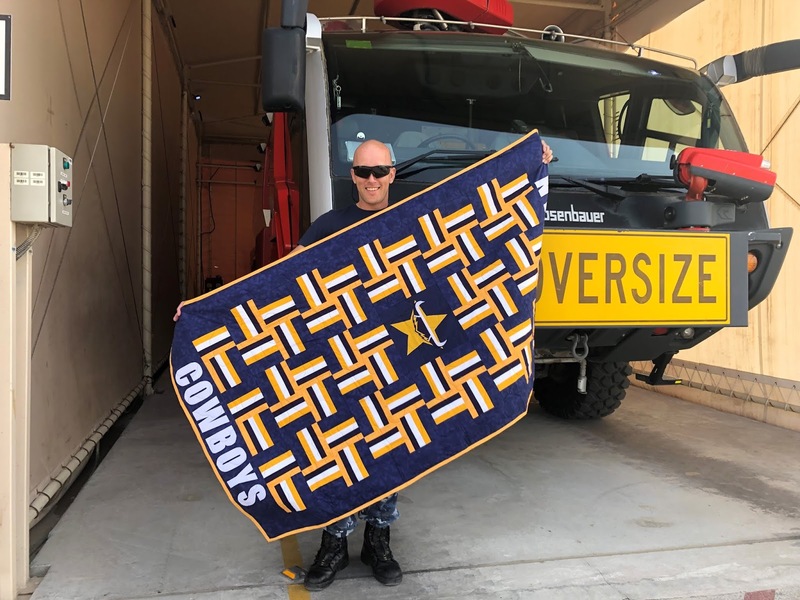 to make quilts for our deployed Aussie Heroes. Include your email address and I will advise you when your blocks arrive. the Blocks that have arrived in the previous week. Hope your week is going well. I am in Melbourne this week to attend a special luncheon tomorrow but more on that after I have been. Last night I met up with one of our recipients for the first time. 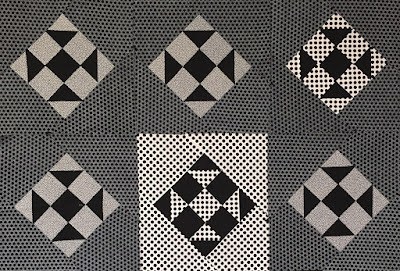 He told me so many times that he just can't explain the comfort he derives from his quilt. He received it last year when he was in hospital for back surgery and was so taken aback and touched to have it given to him. After more than 40 surgeries I am so glad that we could give him some comfort. This great photo was sent to me last week... 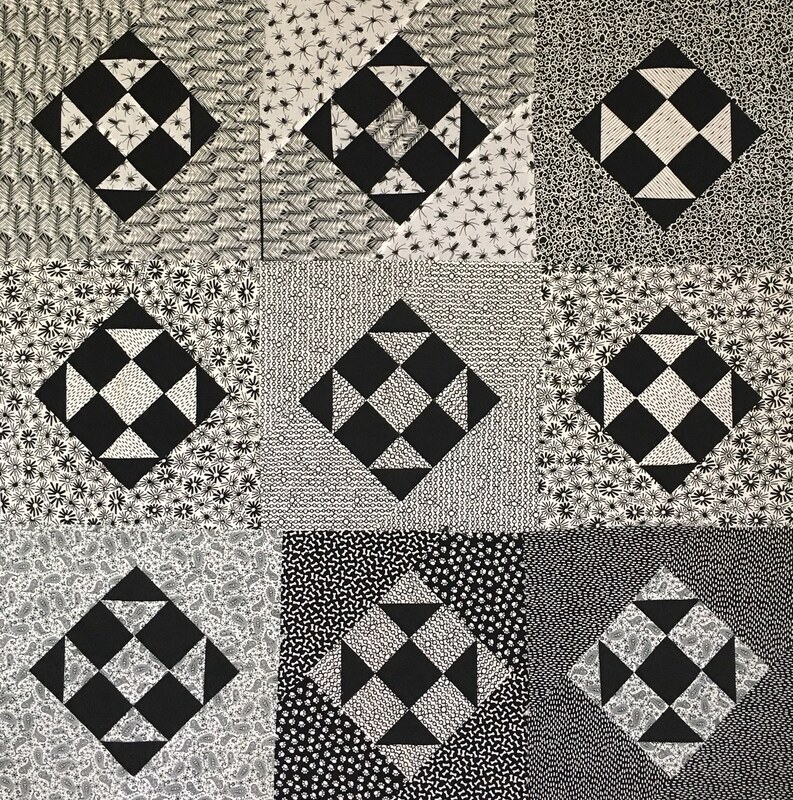 I don't know the names of all the recipients so can't tell you who all the quilters are but if you made one of these quilts and would like a copy of the photo just let me know. Thank you for the amazing quilt and the Tim Tams “good choice”. I appreciate the time and effort that you must have gone to, it has out reached all my expectations and is nothing short of a master piece. 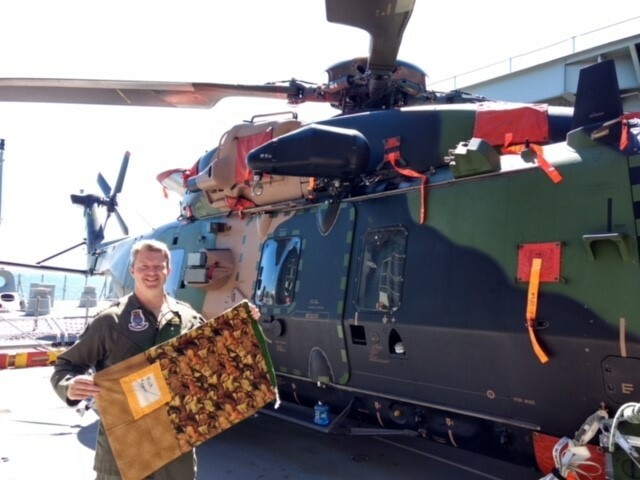 This is my third deployment to the Middle East region, back in Australia I help provide Airdrop support to defence and I am currently assisting in moving cargo throughout the Middle East. I work with a good group of lads and we are enjoying the challenges that an operational environment give us. 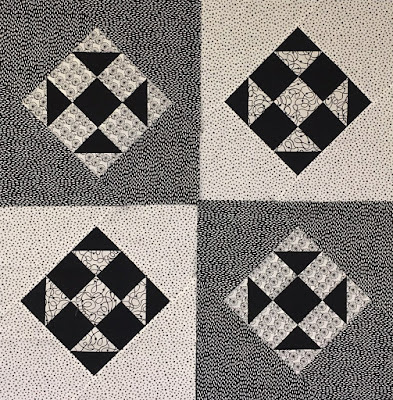 This is the first time I have heard of Aussie Quilt Heroes and the amazing work that you do. I’m glad you enjoyed putting the quilt together and Thor gave you a challenge. Please pass on my thanks to both June and Mary. Once again it is fantastic and will go straight to the pool room. I received the quilt and laundry bag you especially made for me a few days ago. I must say it was a surprise that it came so quickly and they both are wonderfully made. Thank you so much for your effort and time to make this for me. It will be a cherished family possession. Thank you also for the thoughtful way in which you incorporated the various crests and symbols. Thank you also for your lovely letter and for telling me more about yourself and your family. You, your husband and son each have served our country for a lifetime, which is so admirable, and it is good that you and your husband can spend some time to relax and travel. It’s great that you have the freedom to travel around Australia in a camper trailer. I was lucky enough to meet some grey nomads when I travelled to Uluru in 2017 and they seemed to have a wonderful time. As for myself, I am in the Middle East for several months, and I am just coming up to the half way mark. I have been in the Army for nearly 12 years, the entire time as a reservist in the Royal Australian Pay Corps. In fact I thought I would never get the chance to deploy, so it came as a massive surprise to me when I got the call. So my deployment is a bit of an adventure also. Outside of the Army I am a chartered accountant but I do not work in an accounting practice. I have been working as a finance manager in the consumer goods industry for 17 years in various companies supplying grocery and department store goods. While at school one of the teachers called me Che however I am not related to the revolutionary. I hope travel more around Australia when I get back, and you never know – we might run into each other sometime soon. Thank you again for your time and effort, and I wish you all the best in your travels. 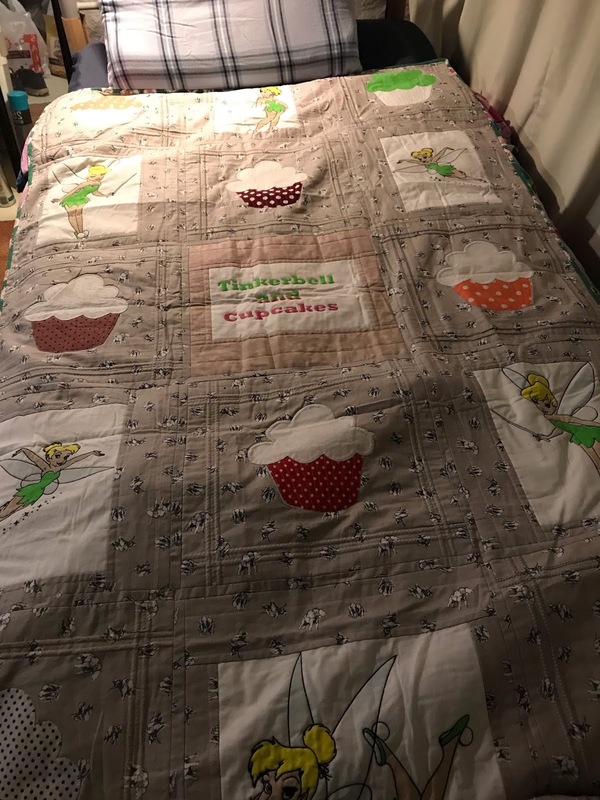 I have received your wonderful quilt and laundry bag and wanted to thank you from the bottom of my heart for your efforts, to say that you absolutely nailed them would be an understatement! I was literally speechless when I opened my parcels, just absolutely perfect! I had to take some photographs of them in my tent and then send them to my partner, who’s father was in 466 Squadron (the three horizontal stripes, as you know) she was just blown away! So thank you again, they are items I will treasure long after my deployment ends and I’m back in Australia. Well, I better be off and don my tin helmet, fix bayonet and get back into my trench, which is code for make a coffee, eat my yoghurt and adjust the air-conditioning. Thanks again so much for the wonderful gifts, they will be well cared for and I will never forget your efforts. Once I’m home I can access my personal e-mail I will endeavour to send you some pics. All the very best for 2019 and beyond and I hope the rain comes soon, it’s tough to see our land suffering so much in the heat and seeing the fishkills in our rivers just breaks my heart so I hope you are all coping as well as can be and staying cool. I hope you can read my chicken scratch. Thank you for the beautiful laundry bag and the mixed lollies “good choice”. I appreciate the time and effort that you must have gone to, it is perfect and just what I imagined. I work closely with the C-130 Hercules, C-17 Globe masters and the C-27 Spartans. I help provide Air drop support to defence, and I am currently assisting in moving cargo throughout the Middle East. This is my third deployment but the first time I have heard of Aussie Quilt Heroes and the amazing work you do. I am a father of two. My wee man is 4 and my wee girl is 2. My wife is holding down the fort. I couldn’t do this without her and I know that your husband and son must feel the same. Thank you once again I wish you and your family a Merry Christmas and all the best in 2019. I am a Navy pilot on board HMAS Adelaide and am lucky enough to receive one of your laundry bags. I chose your Horses bag as my grandparents used to breed horses and it reminds me of them and growing up in the country. Originally I am from Orange NSW however I have been in Sydney for most of my Naval career. I initially joined the Navy as an electronics technician back in 1998 and changed over to pilot in 2012. In all of my time in the Navy (20 years) I have not had a nice laundry bag. It was only recently when I had 2 of the ships issued laundry bags break on me the first time I used them that I then found about that we had a couple of spare bags that have been kindly made by people like yourself. It is an amazing gesture and I am extremely happy that there are people like you in the world. I would like to personally thank you for the quilt I received from you. The love and care that has been sewn into this greatly appreciated and I will treasure it always. The packages deployed troops receive from generous people like you, make a huge difference in morale especially this time of the year when we are away from our families. I am currently deployed on Operation ACCORDION within the Middle East, My role over here is to manage the logistic quality control Framework which supports all deployed Australian personnel within the region. The role is busy but rewarding as I know the work I do impacts how all deployed Australian personnel conduct business. I spent most of my childhood in Queensland and joined the Army in February 2005. This is my second deployment and my first to the Middle East. I am currently posted to Melbourne. My wife and the three children reside there and I am looking forward to returning home to them. I work within a logistics role specifically as a storeman. I have been doing this role for the last 14 years and it is something I enjoy and get great satisfaction from. The specifics of my job can vary from stocktaking, local purchases, warehouse management right through to governance. It can be stressful at times however, like I have previously stated it is very rewarding. 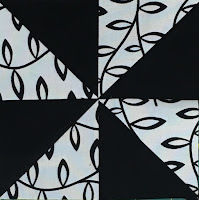 Again I would like to thank you for both the quilt and your ongoing support. It is these acts of kindness that makes these long periods away from my family and loved ones worth it. Thank you for the quilt, it's amazing! It certainly brightened my day. Our tour that began last year is almost complete, there's a few weeks to go. I have a wife and two children, our youngest a girl who was born in December. Fortunately she was punctual and arrived whilst I was on leave right on her due date. Our home is in Townsville and luckily we were spared the worst of the flooding. So you can imagine how happy it made me to receive the quilt you made for me, it's a huge morale booster, something from home that's made with love and care. I am very happy with the focus on the Supercars and Holden, my wife and I have always been avid supporters and love watching Bathurst together. I have enjoyed my 6 years in the Army and look forward to serving well into the future. I hope your serving family members enjoy it as much as I do. They are lucky to have you as family. I wish you good fortune in renovating, selling up and with the move north. Thank you for making this digger's day. I received my quilt and laundry bag today and I absolutely love them! I wasn't sure what to expect as it was a bit of a tricky and specific theme, but Laura K did such an amazing job. I brought them into work tonight and showed everyone, and even my neighbours back at the blocks. My quilt brings so much colour and life to my once boring room, and so much happiness to my heart whenever I see it. Thank you for creating such an amazing group and to all of your amazing quilters! I was pleased to receive your package in the mail and I would like to take the opportunity to say thank you. I am currently serving in the Middle East North Africa Region as a Platoon Commander. My service in the Australian Regular Army began in 2012 when I commenced training at the Australian Defence Force Academy, where I studied a Bachelor of Engineering (Mechanical) and later graduated from the Royal Military College in 2015. I have held platoon command appointments previously where I have commanded a workshop platoon of 40 technically qualified soldiers. Prior to my deployment, I was based in Brisbane and lived together with my partner.. I would like to say thank you for the Parramatta Eels laundry bag you have made. I am an avid Parramatta Eels supporter and hope that they are competitive in the 2019 National Rugby League season. The laundry bag had the nice touch of having a square so I could add my name to it. I would also like to say thank you for your other gifts, including the snickers bars, mug, ball and stationery. I read your letter and you have a long and proud history with the military which I found to be quite interesting. Little gifts and stories like these are humbling to receive and I appreciate the support from home. I thank you for your ongoing support to deployed Australian soldiers. Words can not express how delighted I was upon seeing such a beautiful quilt, you've truly mastered the talent. My wife and daughter (3 years old) are eagerly awaiting my return - only two months to go! Thank you so very much for your gifts and thinking of the people away from their loved ones. Thank you so much for the laundry bag. You have done an amazing job! It's exactly what I was hoping for! It will be put to good use I promise! A bit about me.. 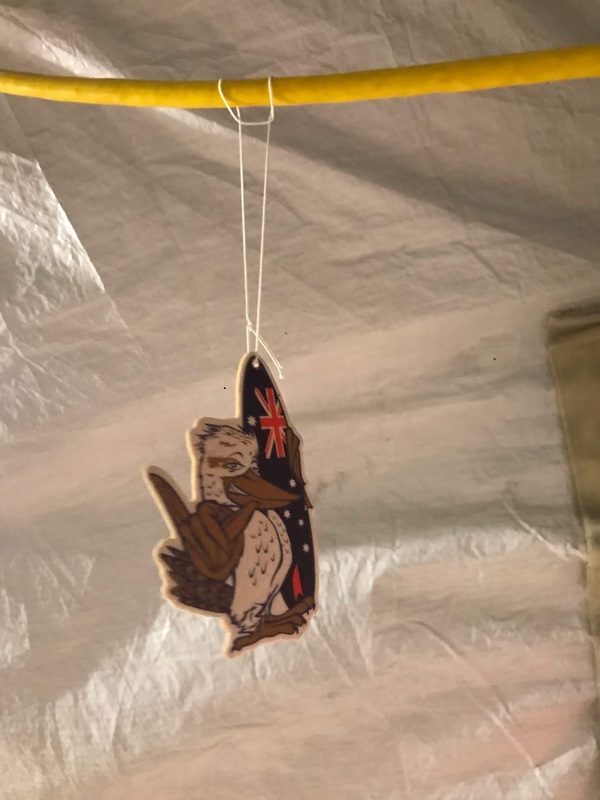 I'll be celebrating 15 years in the RAAF in April (whilst deployed). I am a Firefighter, currently working with a great bunch of guys and girls from Australia and the UK. My role is the Airfield Fire Controller, so I oversee any emergency that happens around the airfield or on base, and coordinate other response agencies if needed to assist. I am the very grateful recipient of a beautiful Hero quilt and laundry bag that you made for me. This is an initial quick note of genuine gratitude. I am humbled that you have taken the time to craft such beautiful items for me. The box arrived on the day of my 17th wedding anniversary. Whilst I can't get a hug from home at the moment, your quilt wrapped me in warm Aussie cuddles from night one. I have been away from my darling husband and two beautiful daughters, (16) and (14) for several months now. They also would like me to say a very loving thank you to you on their behalf. 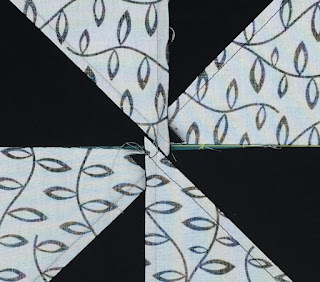 I cried quite a bit on Skype when I proudly showed them the quilt and laundry bag. They were so excited that I had something so special arrive on my wedding anniversary. It meant a lot to them to know someone else was thinking of their mum. 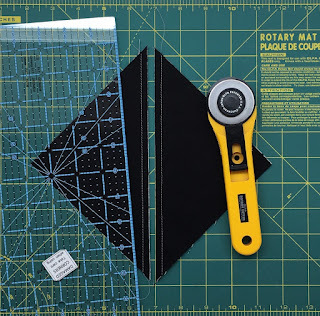 I am in the process of writing you a proper letter which tells you a bit about my life, career and family and will have photos of me with OUR quilt and laundry bag, but I wanted to let you know your package arrived safely and is very much loved. Thank you so very much for the lovely Australian flag themed laundry bag! It really is fantastic. Have been here since mid last year and have another couple of months to go before I head home. It has been an interesting time lately with very cold temperatures and reasonably regular snow falls that have left a few inches of snow on the ground on a number of occasions. I still find it amusing when I see grown men in the military from various nations having snow ball fights! Thank you again for the thoughts and the effort that you have put in to making the laundry bag. It is very much appreciated. 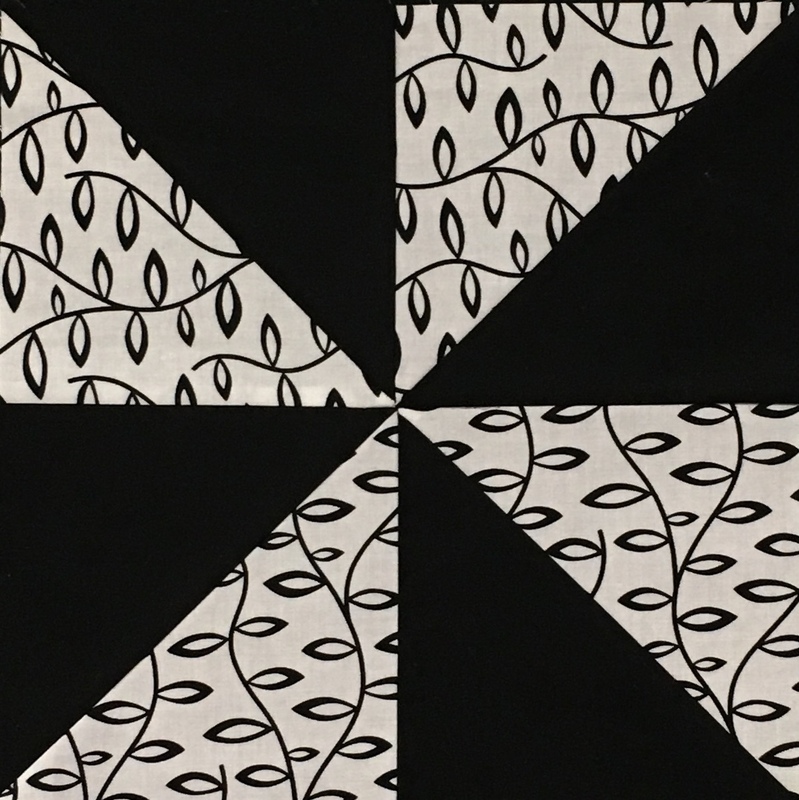 I wanted to thank you very much for putting together my quilt. I was so excited to receive it and really appreciate all the work that has gone in to making it, the pictures and patterns are amazing. 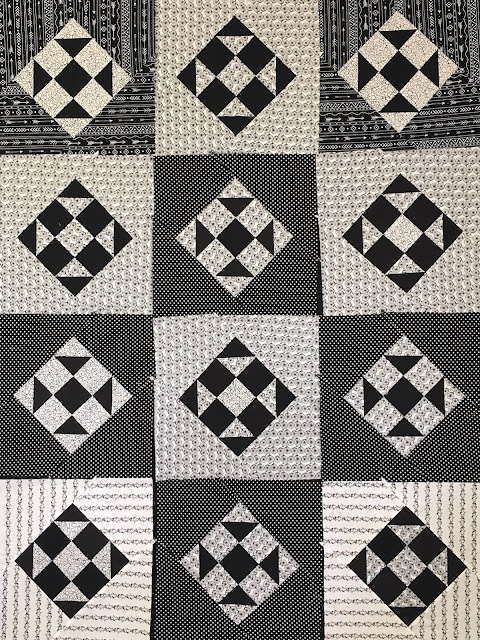 I will enjoy this quilt for many many years to come and I’m sure my kids will love to cuddle up on the couch with it in the cooler months. I just wanted to drop you a quick email to say thank you so very much for the absolutely wonderful quilt that you made and sent to me. It really is a lovely quilt and has significantly brightened up my room! To answer some of the questions in your letter; I have been in the Army for almost 22 years and I am currently on my fourth overseas deployment. I left Australia in mid last year and have another couple of months left before I head home to my family. I am married and I have two children aged 12 and 10, both of who have started at new schools this year as we have moved due to the need for me to start at a new job (still in the Army) when I get home. It has been an interesting time lately with very cold temperatures and reasonably regular snow falls that have left a few inches of snow on the ground on a number of occasions. I still find it amusing when I see grown men in the military from various nations having snow ball fights! 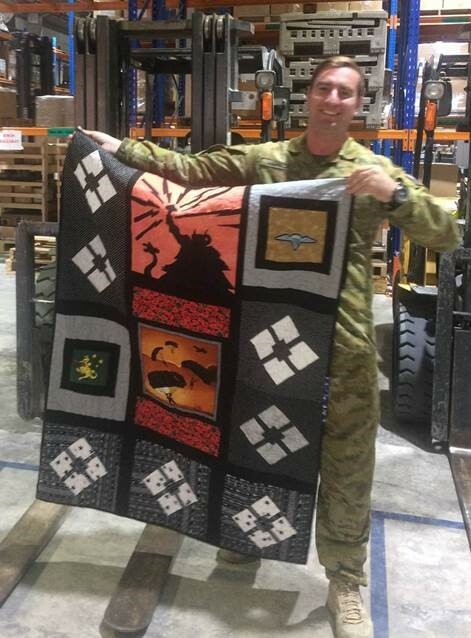 Thank you for all that you do in supporting deployed troops through the Aussie Hero Quilts program. It really does make a difference to use over here, away from home to receive such wonderful gifts from members of the Australian community. 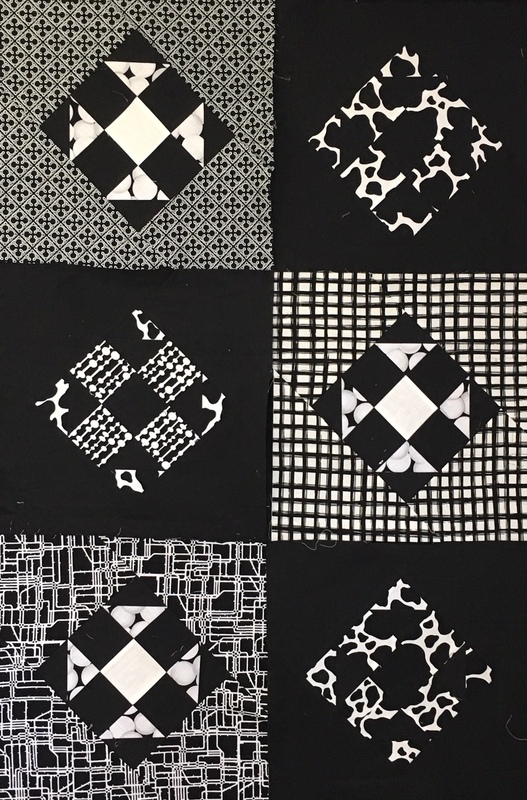 Thank you again for the thoughts and the effort that you have put in to making the quilt. It is very much appreciated. I received my quilt today, thank you so much it’s beautiful. I also loved the other goodies you sent, in particular the air freshener and the lipstick holder. My Nan used to always carry her lipstick in one of these, it’s her first anniversary in a few weeks so it felt like a piece of her was in the parcel. I’ve got two girls (10 & 13) at home with an amazing husband as this is my second deployment and I work in Canberra during the week then return home to them in Wagga on weekends. I couldn’t do any of what I do without their love and support and the support of our friends and neighbours (who’ve become family). I grew up in Ballarat although most of my family are in Melbourne or on the Murray river, so being in Wagga/Canberra is pretty close for regular visits. I’m looking forward to heading home and having a nice break and spending time with my mum. It’s been a tough trip and the quilts you amazing ladies sew make such a difference to morale. Thank you again from the bottom of my heart I’m so grateful for your thoughtfulness. Here are a few photos of your handy work. Dear Ashleigh, Thank you so much for the quilt, it's perfect! I'm a fire fighter in the RAAF. I'm currently the airfield fire controller at one of our main airbases in the middle east. I've been in the RAAF for almost 15 years and can't imagine doing anything else. It sounds like you have a pretty great life, travelling the world and working in a pub! I reckon I'd enjoy working in a pub. Child care sounds like a good choice. There's always going to be work for you, and if you like kids you'll probably enjoy it. Thanks again for the quilt, if you would like to know anything else I'm happy for you to ask. I would like to start with thanking you so very much for all the time and skill you put in to my blanket and laundry bag. I was absolutely blown away with the amount of detail that you added, as were the rest of the people I am currently deployed with. You really added a smile to my deployment. The blanket is currently hanging in my room here as I couldn't bear to risk it being damaged lying on my bed. It is an item I will hold on to for the rest of my life to remind myself of this deployment and how amazingly generous people can be. Hope you had a lovely Christmas and have an amazing new year. Thank you for your beautiful quilt. It is extremely touching to receive something that has had so much thought and effort placed into it. I love the Red Cross pattern and it’s contrast with the jets. It will be a great talking point when I show people in years to come and talk about the work I do. The material for the middle is wonderful and the central theme of friendship, including the biblical perspective, gently reminds me of the wonderful people I work with here and of those back home. It not only reminds me of my friends that I know but also of the great mateship displayed across our wonderful country, especially by yourself and the good people at AHQ. Although I’ve never played basketball, my closest childhood friend was an avid player, so I’ve been to many games and the reverse reminds me of him. So, thank you. It’s wonderful to learn some things about your family. It’s very interesting to hear of your career as a radiographer. I’m sure things are indeed quite different now, as you experienced on the Adelaide. However, understanding our past is an important path towards understanding our future. I’m sorry for not writing you a handwritten reply, but as I’m sure you remember, doctors don’t have very legible handwriting at the best of times and I’m also left handed. What’s perhaps even more touching than your beautiful quilt are the kind words and encouragement you have written in the card. It is uplifting. Please know that your work and ministry is greatly appreciated by myself and all my colleagues around the ADF. What a great bunch of messages. They never fail to make my day and to remind me why we do what we do. Keep spreading the word and happy stitching! 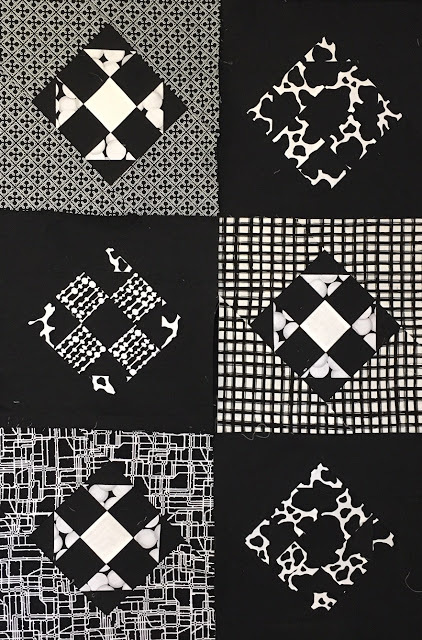 We have a bunch of quilts here at the moment that just need their binding. If you are in Sydney and can collect them from the Aussie Heroes Head Quarters in West Pennant Hills we would love your help. We are happy for you to hand sew your binding on or you can machine sew it if you prefer. Please email on friendsofAHQ@gmail.com if you can help. We still have a huge number of requests on the list at the moment and March is not really a good time for me to take time off. 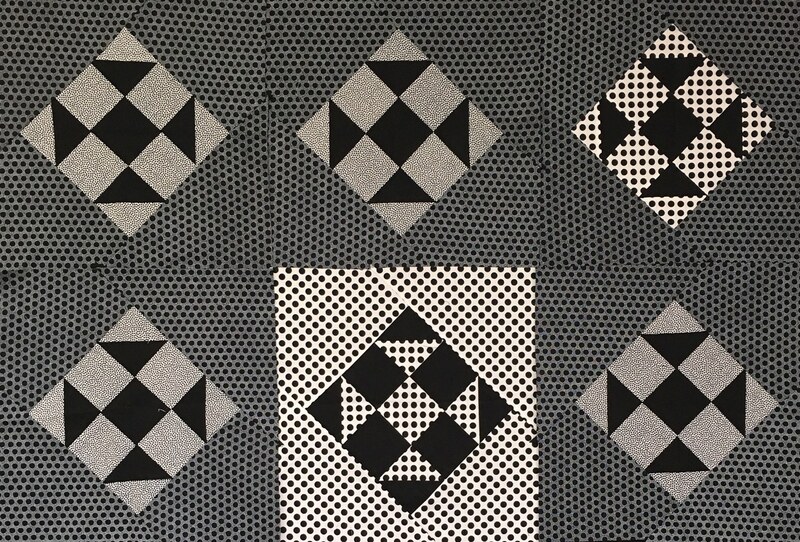 I usually do a lot of prioritising and shuffling around etc to get as many quilts made as possible in the time available. 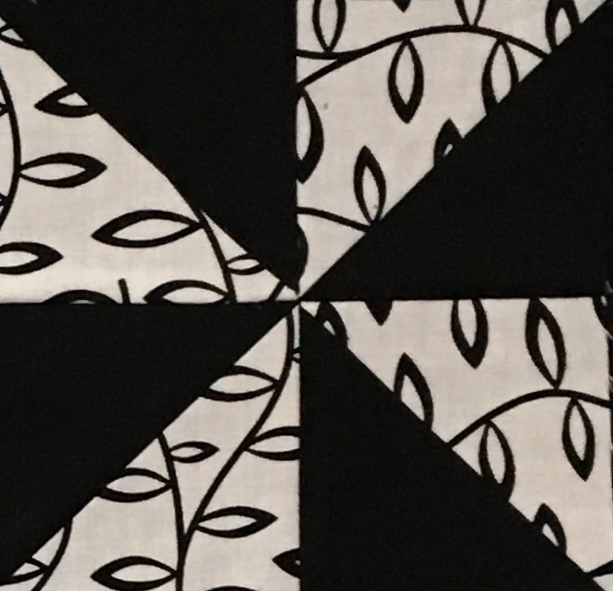 If you are able to take on an extra quilt or laundry bag in the next couple of months or so that would be a great help. Now on with this week’s request list…. Please, please, please read this preamble each week as the info does change. I am receiving a lot of questions from people who have not read this info so you would make it easier for me too if you took a few minutes to read it. 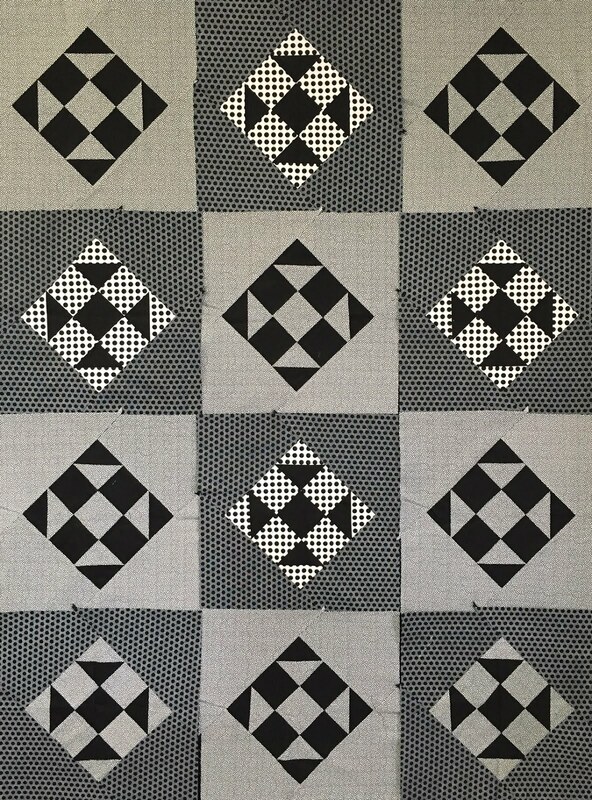 Quilts 6-36 inclusive must be in the mail no later than 1 April. There is no leeway. It would be great if you could take one of these on. The post by date for ALL other items on this list is 1 April please. The first column is the theme or preferences requested. The second column indicated the gender of the recipient. The third column is as follows. The last column with the number is a simple registration number for me to use… it is only relevant for this week only and will change if the request is still on the list next week. Once you have received the recipient’s details you will need to use those to refer to the recipient from then on if need be. If you don’t understand what people are asking for or where to get some of the bits and pieces then please ask me but the following might also be helpful. Afghanistan flag – I can send you one. Rising Sun, RAAF Crest, Navy Crest, Coat of Arms, RAEME and other badges – ask me about them, I can often send you some to include if your request needs them. 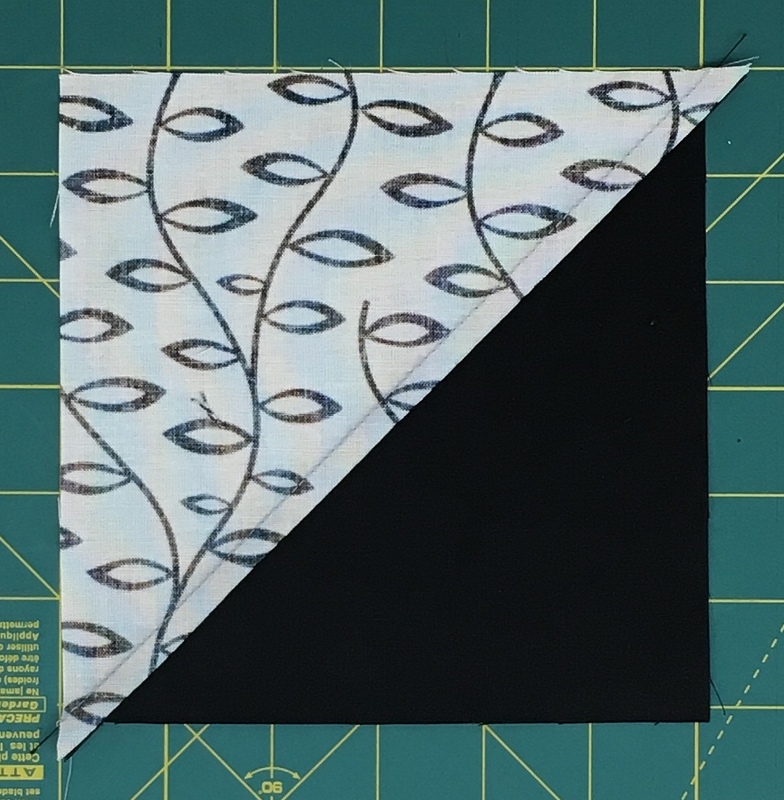 If they want some text and it is too much for you to applique I may be able to get it embroidered and sent to you to be sewn on the quilt or sewn into it. Just let me know what words you want, what colour fabric and what colour thread… keep it simple please. Also include your address in the email to save me time please. Include name and "Will Support Task Group 4 Food"
Black, White, Red, 'The Punisher' Logo, "OP MANITOU Rotation 67"
Anything aimed at a 4 year old girl, and a 5 year old boy. Favourite colours are pink and green. 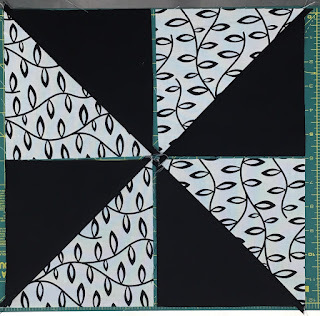 Would love a classic Navy and white quilt please and similar colours for the LB please. Mountain Landscape, natural colours, trees and snow. "Taji VIII - IRAQ 2019", TGT Logo ( I can send you one to piece in), pink, My Little Pony theme. Medical Caduceus (in gold if possible please) hornet, Hercules, C17? Australian Working dogs theme (AWDRI) - Blue Heeler & Rottweiller together playing. Aus inspired background. If I could please request any design with some Afghanistan colours/Afghanistan flag (I can send you a flag to include) that would be awesome. Anything to do with snow would be awesome too. artillery logo and TAJI logo aswell as anything army related. Preferably in colours that resemble camouflage like greens brown and black. Blue and Orange, Marine Aquariums, Hiking and Computer game "Fallout"
Electric Blue, Pineaples, Watermelons, Peaches, Apples. The Phantom (Comic Book). Any comic book scene in colour. Australian flag, writing "BUSKY - AFGHAN 18-19"